MP3 Joiner allows combining many types of audio files together, offering truly lossless performance even for lossy formats encoded with the same codec and bitrate. You can join MP3 files along with many other formats without losing a single bit of audio quality! You can easily join audio files together even if they are saved in different formats. MP3 Joiner can take any number of AAC, APE, FLAC, M4A, M4B, MP3, MP4, OGG, WAV, and WMA tracks (see the complete list of supported formats below), and produce a single file in any supported format. Your source and destination formats do not necessarily need to match – as long as a particular format is supported, you can use any variety and any assortment of audio formats as input and output. You can seamlessly join lossy and lossless formats no matter what bitrate and codec they are using. For example, you can take a mix of MP3, FLAC and OGG files and join them into a single AAC file. While merging audio files in different formats, MP3 Joiner performs automatic format conversion, decoding, resampling and re-encoding files if required. Even if your source files have a different format, recorded with different sample rate, and encoded with different bitrates and different codecs, MP3 Joiner will handle the conversion completely automatically and with no hesitation. Just specify which format, bitrate and sample rate you want your output file, and MP3 Joiner will do the rest! As an added bonus, you can use MP3 Joiner to simply convert file formats. “Merge” a single MP3 file into an OGG track, and your MP3 tune will be converted to OGG format momentarily. Whether you prefer truly gapless playback or want a certain period of silence between the tracks, MP3 Joiner is the tool for you. You can specify exactly how long a pause should be there between the tracks. Choose zero, and MP3 Joiner will merge audio files into a non-stop medley! Why would anyone want to merge mp3 audio files together? In many situations, having a single audio file is simply more convenient than struggling with multiple fragments. For example, you may want to stick pieces of recorded conversations together to have a single presentation. Or you may want to merge fragments comprising a recording of a class, lecture or presentation. Finally, you may just want to get rid of the clutter, merging a zoo of different formats into thematic mixes. You can manually select individual files or batch join entire folders. 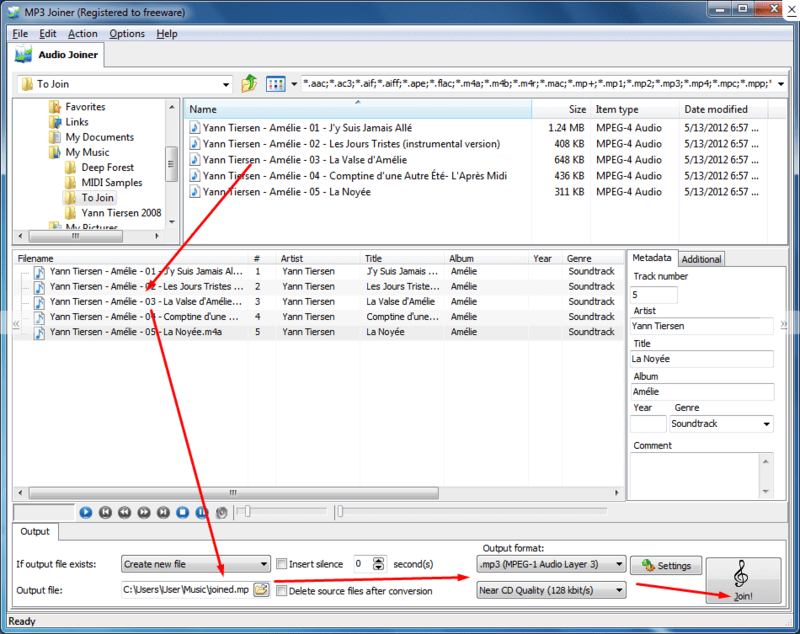 Just drop any number of files into a folder, then specify that folder in MP3 Joiner to produce a single mp3 audio file. User interface in 12 languages.